Thai security forces launched an offensive on the "Red Shirt" anti-government protesters' camp in Bangkok Wednesday, using armoured vehicles to smash down towering homemade barricades. Gunfire crackled overhead as the armoured personnel carriers (APCs) began ramming the piles of tyres and razor wire that form the front line of the Reds' rally base, in a shopping district they have occupied for six weeks. Witnesses saw at least three protesters shot and wounded, while inside the fortified encampment Reds leaders rallied thousands of supporters still inside including many women and children. 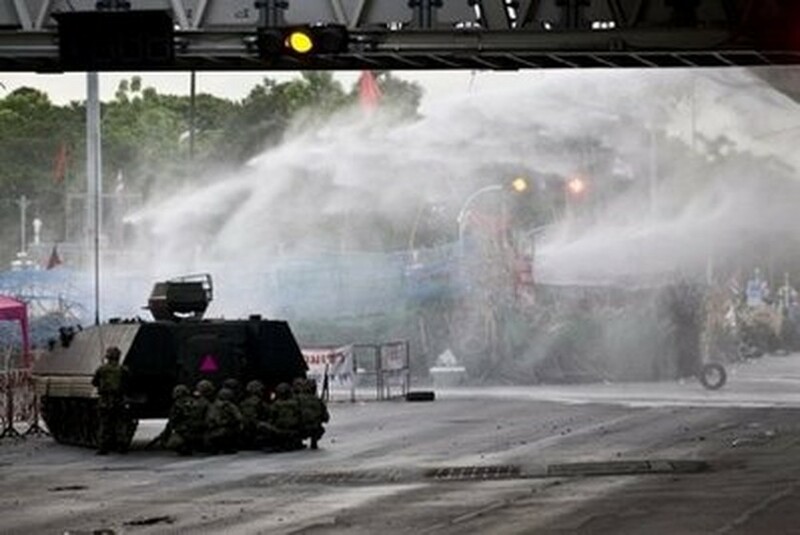 Red Shirt barricades are water-cannoned in Bangkok on May 19. A senator involved in failed last-minute peace talks warned of "unbearable" loss of life and said the government would close down the rally base after an initial containment operation launched last Thursday that left 39 dead. "Negotiations are over now," said General Lertrat Rattanavanich, one of a group of some 60 senators who had attempted to mediate between the government and the Reds, who defied a Monday deadline to disperse. "The government has chosen to decisively enforce the law. The signals are that absolutely the army will win, but the losses will be unbearable," he said in a television interview. "Certainly based on all the signs that I have seen there will be a crackdown, not a containment," he said as hundreds of Thai army and police converged on the rally site. Trucks dropped off troops wearing balaclavas and carrying weapons and riot shields, while a helicopter circled overhead, and elsewhere columns of police and soldiers walked towards the protest zone. Three large fires were burning around the protest zone, sending out massive clouds of black smoke that obscured the Bangkok skyline, including at the Office of Narcotics Control Board building, which was gutted. Defence Minister General Prawit Wongsuwon said the offensive was aimed at "100 percent" sealing off the sprawling rally base and preventing reinforcements from going inside. However, he did not rule out the possibility that the troops could push further in. 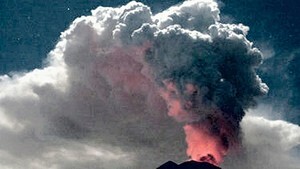 "It depends on the situation, but the authorities will avoid losses," he told AFP. Military and diplomatic sources told AFP they did not expect the troops to clear out the protest zone centred on the strategic Ratchaprasong intersection -- an operation that could incur massive casualties. "They will not go into Ratchaprasong. They want to retake part of the area but they are determined to limit the losses," one Western diplomat said on condition of anonymity. Dozens of soldiers crept along Wireless Road, which runs parallel to the protest zone, crouching behind trees and poles and scurrying up foot bridges near the US embassy, which has been closed. "Danger zone," one soldier said, waving reporters back as muffled cracks rang out from nearby Lumpini park, which the protesters had spilled into during an occupation that has forced hotels and shopping centres to close. Inside the camp, Reds leaders tried to reassure some 5,000 supporters who have remained despite the violence of the past week. "We have to stay calm. Don't break and enter buildings if you are a real Red Shirt," Worawut Wichaidit said from a stage where singers were leading the crowd in protest anthems to boost their morale. Security forces have battled with the Reds since last Thursday as they attempted to seal off the rally base, turning parts of the city into no-go zones as troops used live ammunition against protesters, who fought back mainly with homemade weapons.